10. Hearables. Yes, you read it correctly, not wearables but a new branch called “hearables” which focuses on smart audio wearable technology such as is being launched by Bragi (it has such cool products). While these have typically been Bluetooth devices requiring the use of a phone or computer for central computing, hearables are now being created with their own CPU allowing them to work freely without companion devices and opening them up to a wealth of possibilities for consumers, including eHealth, fitness tracking and business concierge services. 9. eSIMs. If you believe the hype, the days of the physical SIM card are over. As billions of new IoT devices need to connect to cellular networks, software SIMs will be the only way to get scale. Companies like Otono Networks are paving the way with this new on-device and cloud technology to securely provision and connect devices to all manner of wireless networks. 7. Robotics. 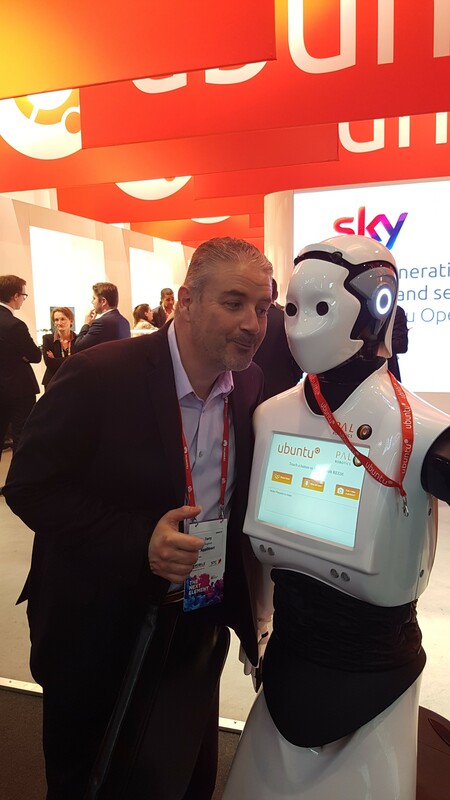 Robots were everywhere at MWC, in fact here is a picture of me trying to steal a quick kiss from a friendly female robot. Consumer robots will have their very own app stores, allowing robot manufacturers to create new revenue opportunities and for owners to unlock new functionality and personalization options for their robot. There also seemed to be a lot of buzz around robots in industrial automation and, following on from number 8 above, how those robots will truly be software defined. 6. 5G. 5G is the next wave of cellular technology, where network technology and device vendors hope to make billions of dollars in sales of new hardware, and where many IoT service providers see 5G as the holy grail of next-gen connectivity. Narrowband IoT, a specialized radio technology standard created to enable a wide range of devices and services via cellular telecommunications bands, was also creating a lot of buzz. 5. Augmented reality and virtual reality. Many booths had wild and wacky immersive headsets where visitors could lose themselves in virtual worlds. Outside of the gaming and consumer possibilities of AR and VR, Mobile World Congress also showcased the many practical IIoT applications in which the devices are being deployed. 3. Connected cars. Most of the car manufacturers had a booth at MWC, as did the vendors that serve them. Most of them were talking about offering apps and services to drivers. While previous years at MWC had automakers telling the story of connected infotainment, this year had many automakers and vendors emphasizing the critical importance of the connected vehicle in the smart city of tomorrow. The connected car is also transforming markets like the insurance industry, where insurance companies will receive real-time feeds of data from cars and will be able to bill dynamically based around usage and behavior (usage-based insurance, or UBI). 2. Gateway. Will tomorrow’s IoT gateway be centered around a utility meter, a smart thermostat, a home entertainment system or a lighting system? Or some other device that gets deployed in every home or business? The battle for the gateway is underway. At Mobile World Congress, every connected hardware company seemed to be claiming that its gadget was (or had the potential to be) a gateway. The companies that win the battle will be the ones that create a compelling case for their hardware, coupled with a wide range of applications, wide connectivity to all the other devices in the home or business, and a thriving ecosystem of third parties that add value and contribute innovation. And the most buzz-worthy phrase? 1. IoT. Well that’s obvious isn’t it? No surprises there. There was a lot of mention of good-old M2M, but IoT has definitely surpassed that now. I counted that approximately 70% of booths had IoT or “internet of things” plastered across their signage. The Vodafone booth had tons of great demos and over 50% of those demos had IoT in the title of the demo. That’s it for the AppDirect 2017 MWC Buzz Index; let’s see what has changed when we revisit it in 2018.